I’m always banging on how everyone needs a purpose. Viktor Frankl wrote about it, the cast of Avenue Q sang about it, my counsellor counselled me about it and now I live by it. Anyway, a while ago, I read Toni’s list ; 101 things in 1001 days and it really inspired me. You can read more about the challenge at the Day Zero Project, I think I love the idea because it’s a natural extension of my Wish List with a deadline to keep me on track. 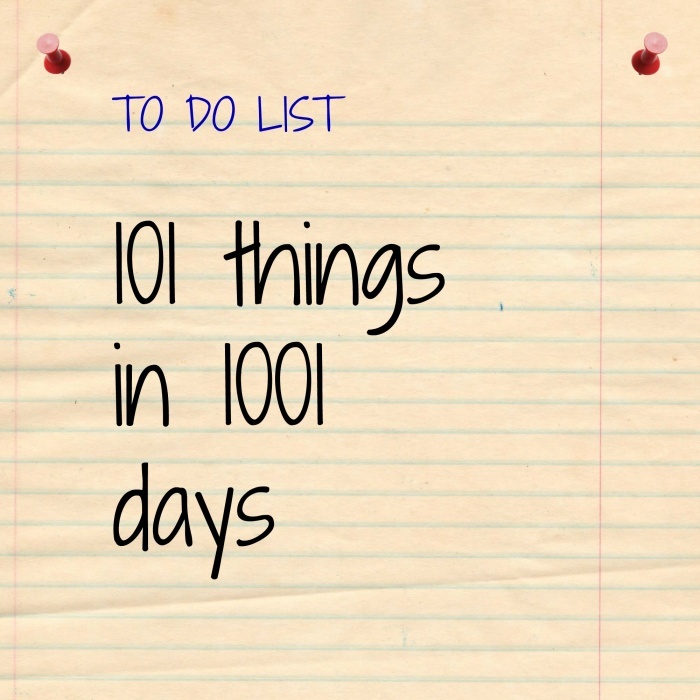 However, it took me almost 101 days to think of 101 things to achieve. There’s so much I’d like to do and so little time to do it in. So, no time to waste, I better get started! This is how it works. My challenge should I choose to accept it, is to complete 101 tasks in 1001 days. The only criteria is that tasks must be really specific (either measurable or clearly defined.) They must also be realisitic and involve some engagement and effort on my part. My challenge starts today, March 25, 2014 and will end on December 20, 2016. Progress so far is not crash hot! 0 out of 101! Watch this space for further updates! Play Recipe Roulette at least once. Perfect the art of making gluten free bread. Eat or cook food from a country I’ve never eaten or cooked before. Dust off sushi maker and learn how to make sushi. Learn to decorate cup cakes. Make my own gluten free flour. Return to Nike Running Club. Keep a Fitness Tips Jar. Try a Beginners Yoga Class. Organise our wedding photos and make an album. Learn how to apply false eyelashes. Learn how to do one up-style. Try something new every day and record it in a notebook. Spend a rainy day watching movies. Plant and maintain a balcony garden. Watch the Lord of the Rings trilogy. Write a google review every time I try a new restaurant. Write a love letter to David. Write 10 Snail Mail letters. Write in my gratitude journal every day. Write to a penpal. Multiple times! Learn how to say “hello” and “thank you” in 10 languages. Complete 12 units of my Counselling Course. Have dinner at Cinderella’s Castle. See the Statue of Liberty. Take a boat trip along the Hudson. Visit a friend from a different country. See the Sydney Swans play at the SCG. Ride the vernicular at Scenic World, Blue Mountains. Phew! That’s a lot of things to do and a lot of fun to have. Will you join the challenge? What would be on your list?